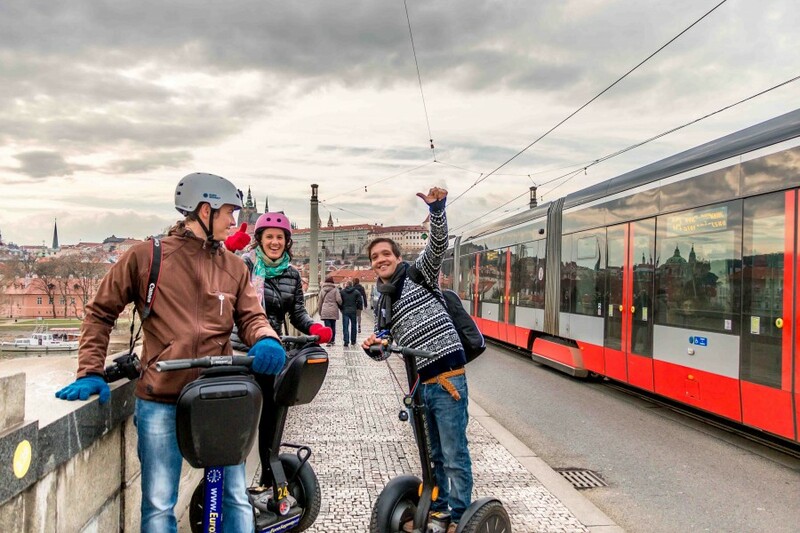 Prague Segway rentals and tours company Euro Segway invite you to take part in amazing segway ride in the Old Town. Only in two hours on segway you can discover main city sights enjoying great old Prague. 2 hours Segway tour in Prague is equal 8 hours walking. During a trip on Segway across Prague you’ll get the experience called “Segway experience”, ease of movement of which is unforgettable. On your coming to Prague you surely have to take a ride across the old city by Segway. The capital of Czech Republic has got a quite big tourist center and even a quick sightseeing of the city centre can take a few days. But Segway in Prague changes a lot: in only two hours of excursion you will be able to go on the chosen route, to see the main sights of the city, take photos of yours and draw a plan of further walks and excursions. Unfortunately, according to the order of city council (city hall) Prague it is forbidden to hire out segways without an attendant. It is connected with traffic regulations around the city, because by choosing the traffic route or speed by himself as well as his inattention can lead to unwanted consequences. At the same time, if you want to amend in a trip route, we can meet your wishes and prepare an individual route. For this purpose it is necessary to contact us in advance as study of an individual traffic route by Segway across Prague demands some time.